I have had broadband or ADSL1 for a while now. Where I live we only have access to ADSL1, ADSL2 is not available as yet. I have had a 1500/256 connection for most of that time. Earlier this year Telstra “took the breaks off” the fastest attainable speed that you could get. We also saw a drop in price for this fastest speed. 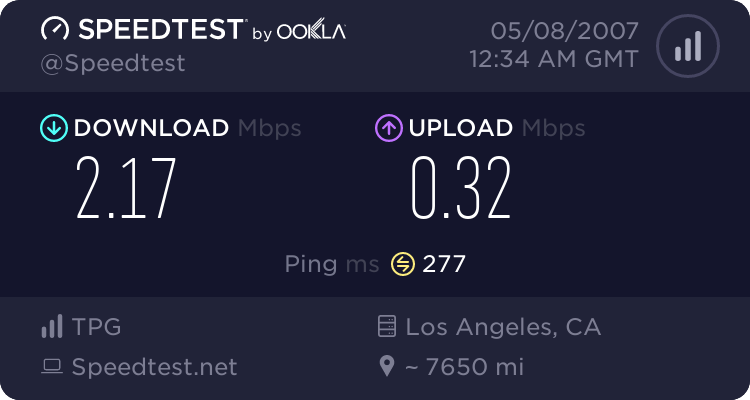 In order to get the “unthrottled” service you had to upgrade your connection and pay a few extra dollars. I have been pretty busy and I only got around to looking at my connection last Friday. Now the plan I was on, the 1500/256 plan dropped in price but I have been paying the higher price as I did not change anything. I found that I was basically paying for the unthrottled service. So I thought what the heck, I am paying it I may as well change to that speed and I got a 100% increase in available bandwidth. I thought that was great. I am pretty happy with these results and time will tell if it is worth it. While I was happy with the download speed that I was getting on my old plan, it was not mega fast but I did not have to wait for much and I had the bandwidth that allowed me to do other things while I downloaded stuff. Now I have bandwidth to burn and the limit that allows me to test out great new services like Joost. The upload speed was the thing that I was more interested in increasing. I upload the podcast each week and lots of files to our hosts and others this will help speed up that process a bit. But not as much as I was hoping. Then again it is very close to the stipulated 384k that is advertised so I should not complain. In fact it is very good really, as you may or may not know you never get what is advertised. Most people I talk to have no idea what speed they are on! As I said previously this service is a variable one so I am going to do a few tests at different times and see what times of day are better than others. These tests were performed with my internet service provider Internode using Speedtest.net. I have found Internode to be excellent and provide a great service at a reasonable cost. ISP choices are a personal choice and you have to be happy but you could do worse than Internode. A list of available plans is available from their website. These speeds may seem poor if you live in Europe or the US and they are in comparison. 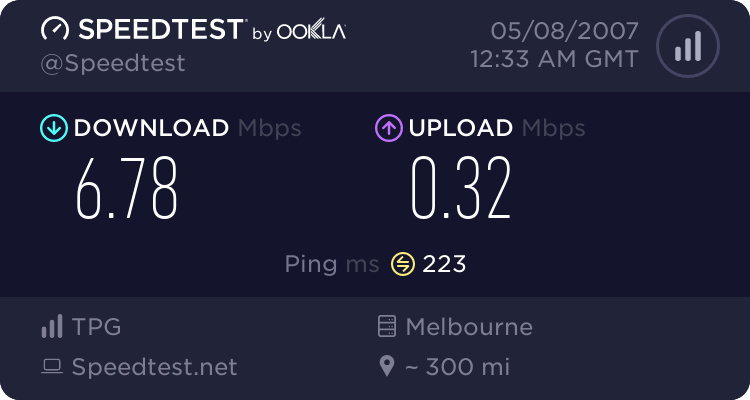 Fact is; that for me this is as good as it gets where I live and is faster than most of the population here in Australia that have broadband access. Fast connection speeds in Australia are hard to come by and when you do they are very expensive, for me this is a good middle ground. SPEEDTEST.NET is a great way to check out how well your ISP performs. It uses a graphical interface with some funky dials and gives very usable results as can be seen here. That is all well and good in isolation, but they also give you the functionality of being able to compare your results to others in your country and the world. These images are via the supplied links that they offer to embed your results into web pages. StumbleUpon, is a great service that allows users to install a toolbar in their browser and “stumble” around the web. But rather than being random it sends you to sites that are A: Tailored to your preferences and interests and B: Where you go is constantly adapted and modified according to what you like and don’t like. The result is custom made surfing, good stuff. And them came video. StumbleUpon is approaching 1.6 million users, most are fans. Although I have had my reservations. Now they are sure to add more to this number with the addition of video. You can log into the video page using your StumbleUpon log-in. Logging in means that your history is remembered just like with the original and the results get more in tune with your taste over the time you use the service. Although you do not have to log in to use the service, once you clear your cookies your results are reset. The videos are sourced from YouTube and Google Video and I am sure that more services will follow. You can choose from different “channels” ranging from The Arts to Video Games. Watch a video and see which other users liked it as well, plus you can watch from their favourite videos as well. Can’t remember a great video that you watched? Have a look at your own history; what you have watched and if you liked it or not. There are options to share a video and send it to someone straight from the page. In my opinion there should a link that you can cut and paste into whatever communication that you wish to use, such as Instant Messaging. The other thing that shines with StumbleUpon Video is the fact that you stop moving the mouse, everything but the video showing dims down giving you that “Cinema” feeling. Tops, I can’t wait to try it out tonight… That’s the kid in me. Nice touch though and attention to detail. There are no ads no commercials (so far). The fact that you don’t have to go anywhere and great content is “pushed” to you is the best thing of all. All making for a great user experience. I agree with //engtech that to go to Google Video and YouTube is tedious in so much as the signal to noise ratio is way to high. Meaning that you have to sift through hours of rubbish to find gems. That has been much more the case as time goes on, if I ever see two teenage girls lip-syncing some crappy song again I’ll scream. With StumbleUpon Video that is hopefully a thing of the past. This is the cream of the crop from YouTube and Google Video in one place and not only that; as you watch and rate it, it gets better! This is a sure winner. Video is the hottest thing on the Internet right now. People want this type of experience. Users like me avoid YouTube for all the rubbish but this makes it worthwhile and I am sure that my usage is going to go up because of it. The best ways to watch on-line video to date. I like this concept. Bloggers advertising their blog on other blogs with minimal outlay. Nice idea, not sure if it will take off or that it will have the returns that they say it will but it is a good idea that might be of interest to bloggers who don’t have the A-List on their side or the cash for a marketing plan. From the looks of their soon to launch site, this service is a replacement for Adwords or similar advertising scheme. Instead of targeted advertising related to the page contents to products that may or may not interest your readers. Bloglinkr advertises blogs on your blog. Not just any blog, the advertised blogs shown in your posts are in categories that you choose. I read that to mean that they are on certain topics or themes. For instance if you had a Mac blog then you could select to show links to other Mac blogs. Great to think that you could recommend other blogs that would definitely interest your readers. You also have a much better chance at getting an income of some description. Also better than seeing that “Casino” Adsense Ad and knowing the site that is being advertised is dodgy to boot. The next best thing is that you get paid for the click through’s. You also get paid for clicks on blogs that are referred to the service by you. I see this a a sort of commission payment, but that is good and probably a good way to build the service. So where does the money come from I hear you say. Well this is not a free service. Yes, you have to pay for it. However from all the signs it looks like it is aimed at bloggers and they know we are strapped for cash. They claim that for as little as $25 (I presume US) you can get started. That is not that bad and I might consider doing it myself. Although it is probably some Java script thing that is not allowed on WordPress. But that is certainly affordable to most bloggers. There are probably “premium” plans that cost more. That will become clear when the service opens. There is no way that they could know this when the service has not even started yet. I think they could sell the idea to bloggers without unsubstantiated claims. They may well be using data from other services but I think that is a reach. It slumps a little into the “hard sell” with statements like that. However I think that it is a good idea with what looks to be a sound business model and has potential. There are over 55 million blogs out there. At $25 bucks minimum per blog, even if they only capture 10% of that; you do the math! 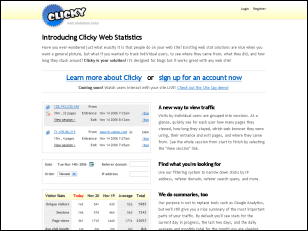 Clicky is a visitor tracking service that has been designed for use with blogs but works on any website. While they do not claim to replace a statistics and monitoring service like Google Analytics or SiteMeter it is said to be a complimentary service to augment your current tools for observing your traffic. While services such as those mentioned give you a “big picture, Clicky gives you a macro version of individual users. Lets you know how individuals visitors are interacting with your site. That may be the case now but I wonder how much money it would take for them to change their minds? However this is not a warning off the service, rather something to keep in mind if you are considering using it. I guess that you figured that you have to cut and paste some code to your web page, you guessed right. They claim that it works on any web page. There are instructions for use with Blogger and even WordPress.com. Only the Blogger code is shown on the information page. I am no code monkey but it looks like there is a script in the code shown. As all WordPress.com users know all code containing script is stripped when you try to put it on a page or a sidebar widget. So unless the code is different for WordPress.com blogs then I can not see how it would work. Feel free to comment on this if you know for sure or why I might be wrong. At this time the service is in beta and free. Once it launches they plan to charge a “reasonable” fee (no hints). It is worth noting that there are other sites that track individual users. Such as Crazy Egg that uses a “heat map” to display the “hot spots” or frequently clicked parts of your site. This type of tracking is a fine line, I have to admit I would have reservations about using it. It does feel a bit intrusive. But that is just me, what do you think? So Telstra (the major Telco here in Australia) get all fired up about their new service. It is called the “Next G Network”. Basically offering WiFi where-ever you go. The only upshot as far as I can tell with this is that you can take your Internet connection with you. That is they supply you with a “mobile card” that you install your Laptop and you can be connected while you travel, as opposed to find some unsecured WiFi network somewhere. If you mainly or only use the Internet at home then this is a rip off of staggering proportions. So there is on offer two plans and yes they are locked for 12 months. The first plan called “G Fast” offers 256 kbps and 128 kbps upload. There is a 200MB option or one GIG, and that is per month… The cost… $49.95AU and $79.95AU respectively. First up the speed is poor even for WiFi and second you would not want it to be going any quicker as you are charged 30 cents per MB once you go over your quota! So that too slow for you and a bit restrictive? Well we are geeks and we need speed right? Well maybe the “Super G Fast” is for you. There is only one speed here and that is 550 kbps to 1.5 mbps download (average) with an upload speed “bursting to 384 kbps. This plan is offered in two options; by the hour or by the volume. 10 hours or 20 at a cost of $29.95AU and $49.95AU respectively. The volumes offered are 400MB, 1GIG and 3GIG. Costing, $79.95AU, 109.95AU and 199.95AU respectively… Oh and I forgot that there is a one off fee of $299AU for the wireless card.Is it just me or does this seem like there is something wrong? 1. The G Fast plans will have a download speed up to 256kbps and an upload speed of up to 128kbps. These speeds are a theoretical maximum. Actual speeds will be slower. The Super G Fast plans will have an average download speed of 550kbps to 1.5Mbps and an upload speed bursting to 384kbps. Speeds may vary due to congestion, distance from the cell, local conditions, hardware, software and other factors. 2. Usage means monthly combined upload and download data transfer. 1 Gigabyte = 1000 Megabytes. This country is going bloody mad. Anyone that thinks this is any type of good deal could be in for a shock. Especially when you consider that Google is delivering free wireless access to the whole town of Mountain View where they are based and they want to do it elsewhere! Not to mention the fact that this type of thing has been available in the US for about the last 6 years. Sure I don’t have the ability to have access no matter where I am. But if I wanted WiFi at home, the addition of a Wireless modem would be all it would take and that would be for less than 200 bucks! So taking the mobility part of the equation out. I have a connection here at home that is 1.5 mbps download and 256 kpbs up. No that isn’t break neck speed but it is the fastest available here in Cairns, Australia at the time of writing this. I pay a quarter of the cost above and I have 10 GIG to play with! I am no maths genius and I may be wrong here but this whole thing seems very, very steep. The sad thing is that this will be the only high speed Internet option available to some isolated communities here in Australia. What choice does that leave them? I certainly hope we are rescued from these crazy times by someone, some company or at least the Australian public waking up to themselves and realizing that there are other options other than Telstra. Force the competition and start giving yourselves the choice at competitive prices and stop complaining. No thanks Telstra I will have my restricted mobility. I think that there might be a problem with Odeo’s email notification. I was actually told by someone yesterday that they had sent The Global Geek Podcast an audio message via Odeo. The message was from our CEO Cameron Reilly so it was important that we got it. More importantly it is important that we get audio messages from the listeners. I don’t visit our Odeo Inbox on a regular basis, I rely on the email notification to let me know there is a message waiting. I have not checked the RSS feed for a few days. I have been busy doing other things and I only regard the RSS feed as a backup to the email notification. I am still waiting for the email notification for the Odeo inbox from a message that was left two days ago. I am starting to think that the email notification is busted or at least has malfunctioned in some way. Before you think that the email settings are wrong or that my spam filter has canned it, think again. I have checked the settings in my account at Odeo and all is correct there. In addition to that it is not only me that gets an email notification that a message has been left. My, co-host also gets a notification as well. We have a pretty cool email setup where we have multiple recipients for a single address by default. So Sebastian is still waiting for an email as well.